A split cascade. 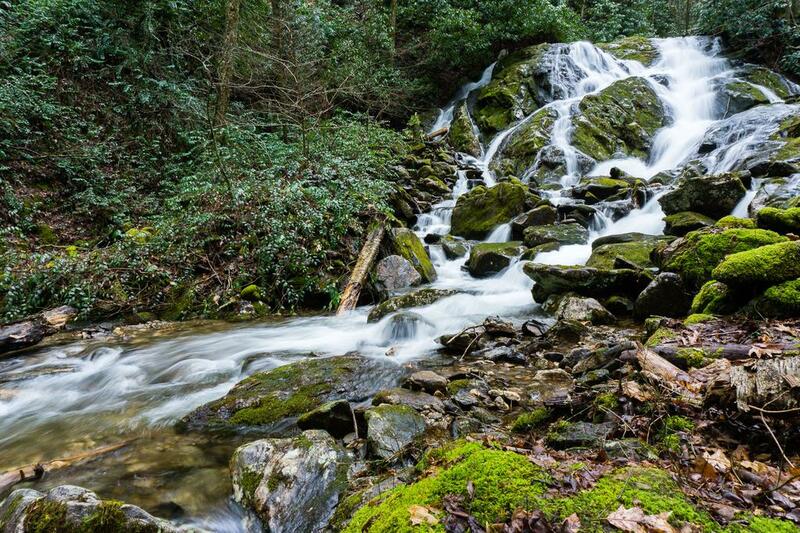 The creek is about as scenic as the falls themselves. The name "Little Bird Falls" comes from a sign nailed to a tree at the falls. Green Creek flows under NC Hwy. 215 about 5.7 miles north of the intersection with the Blue Ridge Parkway. There is barely enough room for a (small) vehicle to park off the shoulder here. If you can't swing it, you'll have to park up or down the road a bit and walk back. The path starts as a scramble up the bank under the rhododendrons, next to one end of the guardrail where the road crosses Green Creek's gully. Which end? If you're coming down 215 from the Parkway, it's the far end of the guardrail; if you're coming up NC 215 from Lake Logan, you reach the correct end of the guardrail first. The scramble path pops out on an old logging roadbed after just a few feet. An easy hike upstream on this roadbed ends right at the falls.